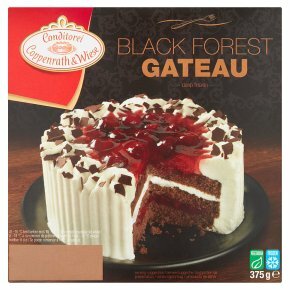 Layers of chocolate sponge with fruity cherry sauce and creamy vanilla flavour filling, topped with cherries. Deep frozen. No artificial colours, artificial flavours or preservatives. Vegetarian. Dear customer, stones are a natural part of cherries. Whilst every care is taken to ensure that they are removed, some stones may still be found in the product.